The new study is above and the news release from USC is below. The results are certainly encouraging and suggest that a new transit project can influence the behavior of those who live nearby. I think it’s also worth noting that the sample size wasn’t huge — 200 households. I also was struck by the finding that use of the Expo Line was higher among households that were both near the rail line and frequent bus service. I expect that Expo Line ridership will rise when the second phase between Culver City and Santa Monica opens — at this time that’s forecast for early 2016 — if service is fast and frequent. Dec. 16, 2013 – Angelenos who live near an Exposition Light Rail station dramatically reduced the number of miles they drove and tripled their rail ridership after the opening of the new rail line last year, a new USC study released Monday shows. Residents living within a half-mile of the new station traveled 10 to 12 fewer miles daily by car – a 40 percent decrease – after the new rail line opened, according to the study. That same group also tripled their rate of rail travel, from an average of one daily rail trip per household before the Expo Line opened to almost three daily household rail trips after it opened, according to the report. The Expo Line at the La Cienega station. Photo by Steve Hymon/Metro. The findings represent the first experimental study of the effects of a new rail line in Los Angeles. The study’s authors followed more than 200 households over seven-day periods in fall 2011, before the Expo Line’s initial opening, and after the rail line opened in fall 2012. The households were split into two groups: people who live within a half-mile of an Expo Line station, and those who live farther than that distance from a station. The researchers asked participants to track their travel by recording daily odometer readings for all vehicles and logging trips by mode of travel. About half of the participants also carried a GPS device and accelerometer to measure their travel and physical activity. 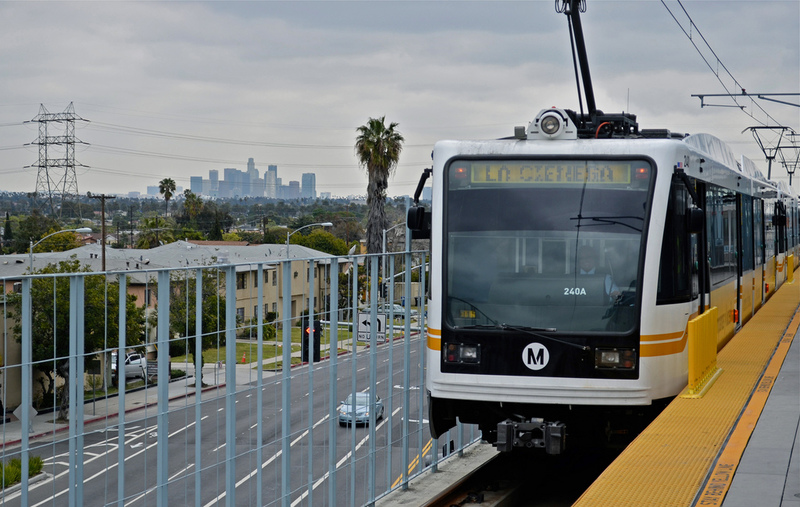 • Residents living near Expo Line stations produced about 30 percent less carbon emissions from their vehicles after the opening of the rail line than did residents living farther from the stations. • Those living near the Expo Line stations who were the least physically active before the line’s opening increased their moderate or vigorous physical activity by 8 to 10 minutes per day, as compared to those living farther away. • The impact of the Expo Line on driving and rail ridership was largest near stations with more bus lines and on streets with fewer traffic lanes. “This suggests that bus service can increase the impact of rail transit and that wide streets, which can be barriers to pedestrian access, reduce the impact of rail transit, at least in the Expo Line corridor,” Boarnet said. In 2008, Los Angeles residents approved Measure R, which is projected to raise $40 billion over the next 30 years to fund more than a dozen rail and rapid transit projects. The first phase of the Expo Line opened in April and June 2012 connecting downtown to Culver City and is currently being extended to Santa Monica. Average daily ridership on the Expo Line numbered 27,603 people in October, up from 21,382 a year earlier, according to Metro. Funding for the study was provided by the Haynes Foundation, the Lincoln Institute of Land Policy, the Southern California Association of Governments, the University of California’s Transportation Center and Multi-Campus Research Program on Sustainable Transportation, and the USC Lusk Center for Real Estate. I presume that the largest amount live west of Flower and there is no need to transfer to a northbound bus from a eastbound bus. Also hopefully the rail service is faster than bus service into downtown L.A.
Now if we could just get some light rail in the Hollywood and West Hollywood area into downtown. But of course a planned freeway was abandoned when Jerry Brown was govenor before so what should we suspect. Out of curiosity, is the operating speed not set in stone at this point? There are general safety regulations for speed, but it’s hard to say for sure what the speeds for the entire line will be until the trains are actually out there running. Service times improve as Metro works to coordinate with traffic signals, grade crossings, etc. Steve – why is this shocking? Isn’t that expected? When you provide convenient bus and rail, people will then choose the good alternative means of travel. thank you for the reply. As a daily commuter by the Expo Line, I’m very interested in possible improvements in running speed. It’s not that the line is slow necessarily, but as you say there are parts where the coordination doesn’t seem to be there yet. In particular, when I take the eastbound train in the evenings, the stretch between Jefferson/USC and 7th and Metro seems to take a disproportionately long time compared with the rest of the ride. It seemed to me that Steve was saying that given an equal opportunity to take two different forms of transit, riders were opting for rail over bus. Could’ve misread that one, though. Now if they can only hurry up fixing everything that’s wrong with TAP, move to a more profitable fare structure, rebuilding back the old stations so that they all can be latched up, building Subway to the Sea, the Crenshaw Line to LAX, the Regional Connector, figure out a way to link the SFV and West LA all the way down to the South Bay with mass transit, doing away with ridiculous zoning laws, parking space requirements and height restrictions we can finally move LA into the 21st century. It’s great to see that LA is finally moving in the right direction as with the rest of the world where mass transit becomes the preferred method over cars. But we have a lot more things to do. Let’s use this as a great example to shut up the naysayers who say keep saying no to everything (hint Beverly Hills) when it works perfectly fine all over the world. It’s a pity the study didn’t address questions relevant to intensification, such as the impact on peak hour travel. Off-peak road congestion is usually not a problem, because the roads have sufficient capacity. While vehicle miles dropped 40%, did the number of peak trips decline by say 50% ? This could mean that another 50% of residents could be introduced into the suburb through intensification with no net increase in peak hour traffic. The detractors of intensification complain about the increase in traffic following completion of a high-rise TOD. They think everyone will live like them, travelling everywhere by car. However a new resident who chooses a high-rise TOD will most likely have most of their peak hour journeys along the transit line, It would be great if data could show something like 10 new TOD residents generating the same amount of peak hour traffic as 1 resident in a nearby car-dependent suburb. This sort of evidence from LA would help put the case for intensification. Remember though that this line runs through an area that was built as a (Sam Bass Warner) “Streetcar Suburb” even if this line was not used by the (LARy) streetcars that served it.